Habitat: Most often, they prefer wetlands, where highly productive waters produce large amounts of floating, emergent and submerged vegetation Wetlands also produce a great deal of aquatic invertebrates on which mallards feed. 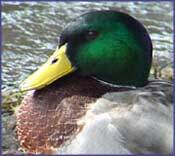 The mallard is undoubtedly the most recognized waterfowl in the world. Mallards are the most abundant and widespread of all waterfowl; every year millions are harvested by hunters with little effect on their numbers. The greatest threat to mallards is loss of habitat, but they readily adapt to human disturbances. The familiar duck morphology is complemented with a iridescent blue speculum on the wings in both sexes. On the male, the notable characteristics are the green iridescent plumage on the head and neck, and curled black feathers on the tail. The female's plumage is drab brown. The familiar "quack" of ducks is from the female mallard. It is named the "decrescendo call", and can be heard for miles. A female will give the call when she wants to bring other ducks to her, such as her ducklings, and as a result it is also known as the "hail call". The mallard duck call is a low reedy kwek-kwek-kwek.. Hear It Now! Waterfowl cause significant losses to agricultural and aqua cultural crops, damage golf courses, cemeteries, lawns, and gardens, and contaminate reservoirs. Their activities can cause real economic hardship, aggravate nuisance situations, or create human health hazards. Duck problems in urban and suburban areas can be a nuisance if left undisturbed. These ducks will readily establish nesting territories on ponds in residential yards, golf courses, condominium complexes, city parks, or on farms. Most people will readily welcome a pair of ducks on a pond. They can soon turn from pet to pest, however. A pair of ducks in a very short time can easily become 50 to 100 birds that are fouling ponds and surrounding yards and damaging landscaping, gardens, and golf courses. Many people consider unconfined domestic ducks a nuisance. Some breeds can be aggressive toward pets and children, deposit droppings where they are not desired, and cause damage to lawns and gardens by their feeding and nesting activities. In small, urban ponds, high bird densities contribute to reduced water quality that lessens the aesthetic value and presents a potential public health hazard. Domestic ducks also can transmit diseases to wild waterfowl. All confirmed outbreaks of duck plague in wild ducks have been linked to domestic ducks. Domestic ducks can be difficult to remove. Once established, immediate corrective landscaping and behavioral modification is imperative: Remove cover shrubbery; use herbicides to eliminate aquatic vegetation; and reduce fertilizer, especially around pond area, to make grass less nutritionally attractive. Several visual scare products like theGator Guard and Prowler Owl combined with Bird Stop taste aversion should be employed as soon as the birds enter the area, varying in location and type. For more established flocks, audio scare devices like our top selling GooseBuster which projects true geese distress calls through several speaker locations in a random pattern to scare them away. All systems require constant re-enforcement and should be relocated frequently, especially the Gator Guard replica to remain a realistic threat to the birds. The Industrial Bird Hazer has shown effectiveness at repelling ducks away from large open areas, like on golf courses. See our complete list below of recommended bird deterrent products to repel ducks. A "synergy" or combination of bird repellent products typically offer the most successful solution for repelling ducks. For bird control solutions, we often recommend using companion products by combining electronic sonic repeller devices or bird hazers with visual scare deterrents, physical bird barriers or scent and taste aversion products. This kind of multi-sensory attack is extremely effective in deterring pest ducks for good!